There are few people amongst us who haven’t looked at the European bikes of 60s & 70s and thought: “those guys really knew how to build bikes”. 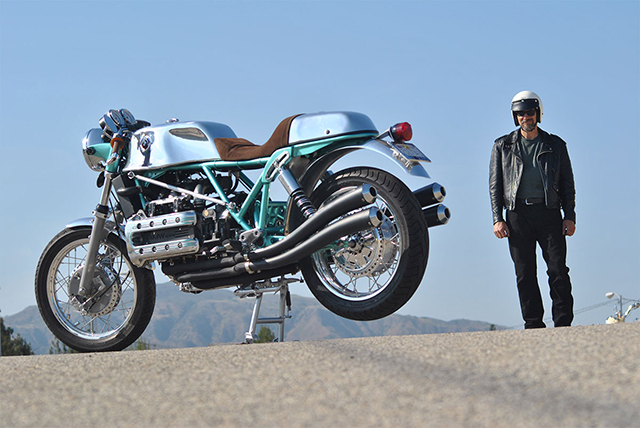 Italian, German or English, the motorcycles of that age have inspired many a modern day builder to create something beautiful. 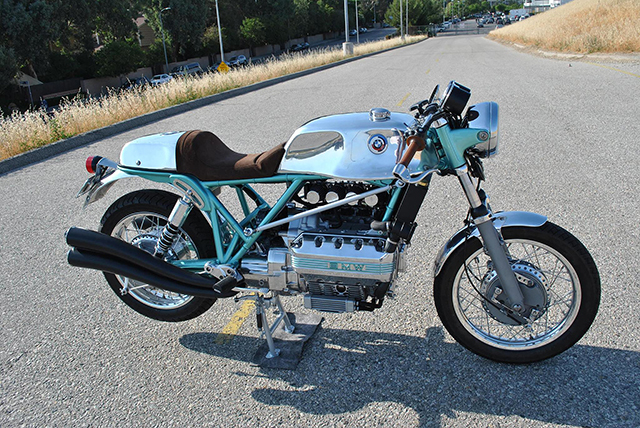 The bike featured here today has been influenced by all three of the above bike building greats, the Beemer created using K-series mechanicals coupled with old school aesthetics. Built by Larry Romestant of Romestant Engineering and Design, we would like to introduce you to the ‘Bell Kaff’. Italian inspiration has inspired much of the look of the bike. 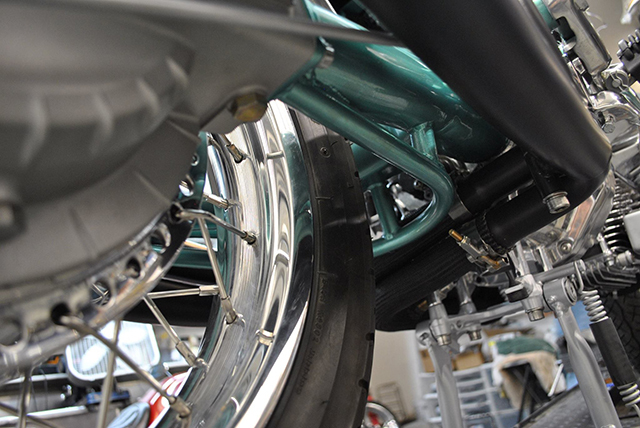 While the bike was stripped down, the opportunity was taken to paint the frame in Imola Green. This is the same colour used on the 1974 Ducati Supersport, the famous ‘Green Frame’ model. The fuel tank is inspired by the 74 MV Agusta America, albeit with a less square profile. Following the lines of the tank, the 750 SuperSport inspired seat is finished off with an OEM 900SS tail light. The suspension system in the machine is a work of art. The adjustable preload shock mounts are Velocette, setting the rebound rate of the late 70s BMW swingarm and differential. The rear hub is something you won’t buy off the shelf, it’s a one-off unit turned from solid 7075 billet aluminum. 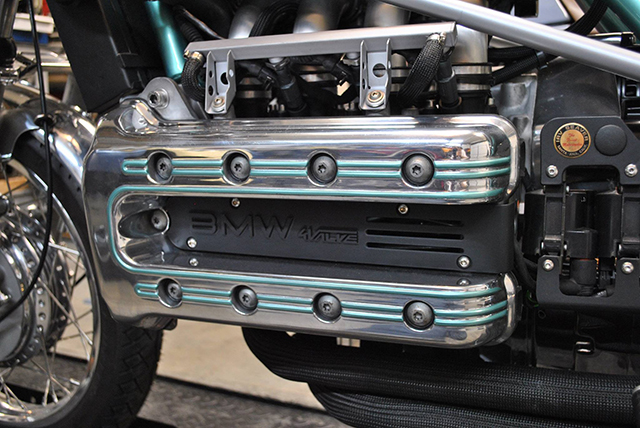 At the front end sits a K75S suspension setup, sporting a Tarozzi period aluminum fork brace. Though the brakes are both drums in keeping with the period theme, the front Suzuki GT750 4LS assembly is assisted hydraulically, with the a Patent-Pending under-tank brake mech, that converts cable energy to hydraulic and back to cable. The brake lever mechanical effort is greatly reduced, allowing single-finger lever pulls. The brake itself is modified, with competition level linings, increased cooling and beefed up link arm assemblies for reduced flex and significantly better stopping power than what was available back in the day. The bike weighs in at 529lbs dry, nearly 100lbs heavier than the bike the drum was designed for, so the brake is less than ideal, though manageable and is augmented with judicial use of engine braking, which fortunately, is massive. Future builds will sport 250 and 300mm 4LS drums of my own design, as well as Grimeca and Fontana replica 4LS units, and of course single and dual disc brakes as required. Performance has been upgraded on the build as well, to give the angular powerplant a little more poke. 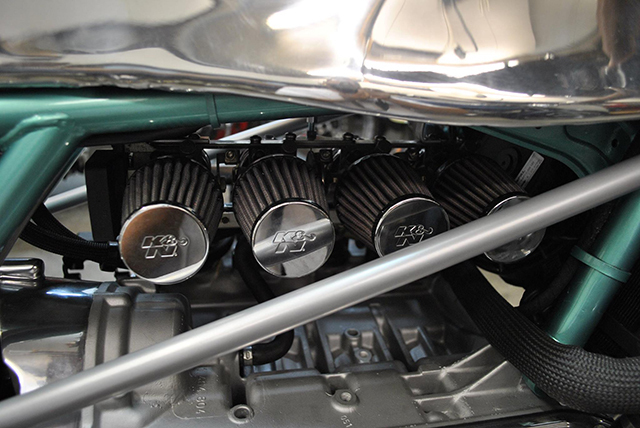 The motor breathes in through K1200 FI throttle bodies, onto oversized intake runners packing 230cc injectors. Fuel management is Bosch 2.2 Motronic controlled and the exhaust system is handmade using Magni styling for inspiration. 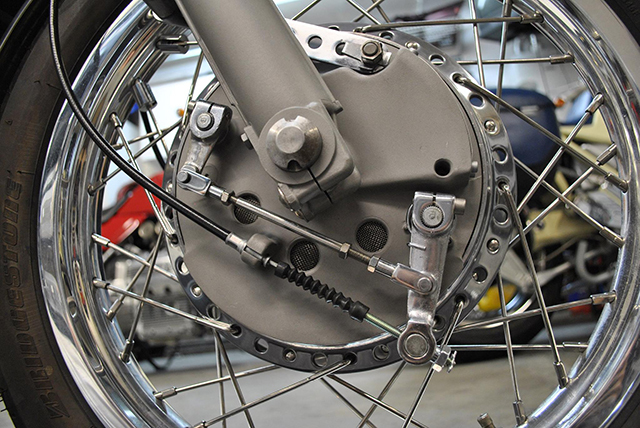 To give the bike the look of 70s period styling, both front and rear brakes are drum units. 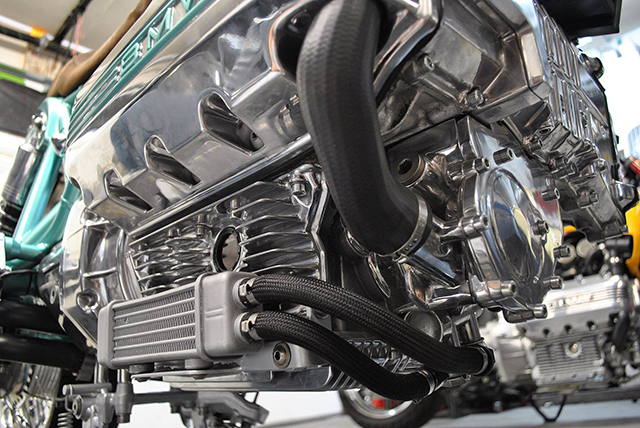 The front end is a Suzuki GT750 four leading shoe setup, assisted through a system which converts cable energy to hydraulic then back to hydraulic, which according to the builder allows for “single-finger lever pulls”. The front brake unit itself has been upgraded using competition grade linings, ‘beefed up’ link arms assemblies, and higher cooling ability. 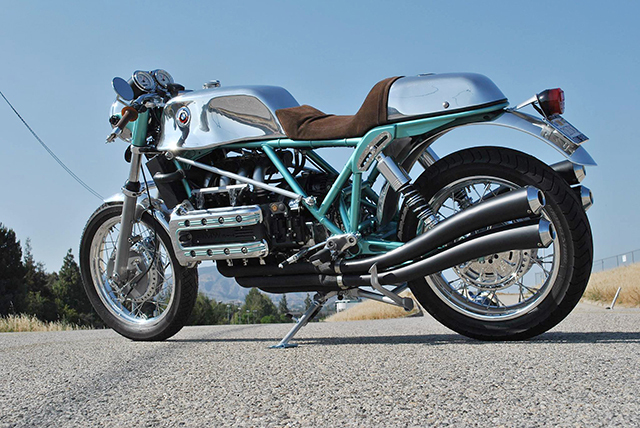 By raiding the BMW parts bin and putting his own touches on the build, Larry Romestant has produced a mucho modified motorcycle which is a fitting tribute to a golden age of motorcycling. 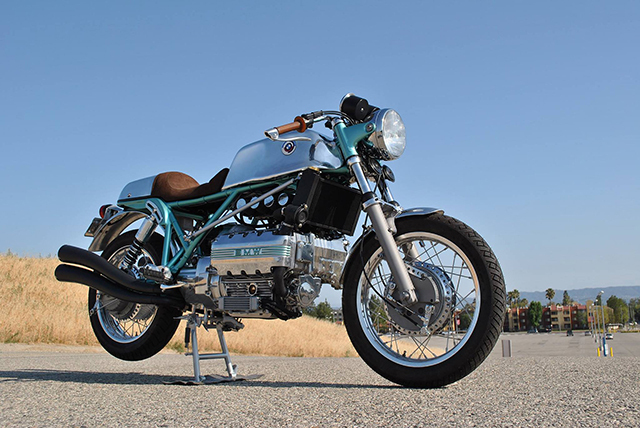 As Larry puts it: “My goal was to build a bike with all the elements without looking cobbled together, rather appearing as a bike that could have been produced by BMW and would have been found on the dealer’s showroom floor, even with the 1200cc Flying Brick motor that would not be available for another decade.” We think he has certainly achieved his goal. 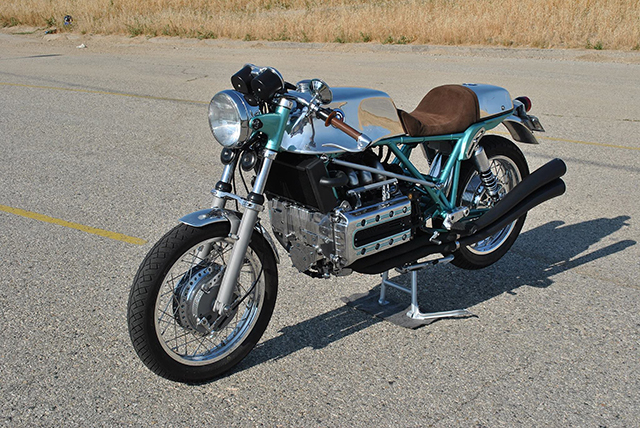 If you want see and hear this beautiful ‘flying brick’ cafe racer in action, hit this link.